Nahima's (5 years old) newest thing is talking to her friend "a Duende" on her toy cel phone. He lives in the pila in their backyard. Lorena wanted her to talk to him last night but Nahima says only during the day. She is afraid when it's dark. Lots of different fotos on the Internet so above is just one. 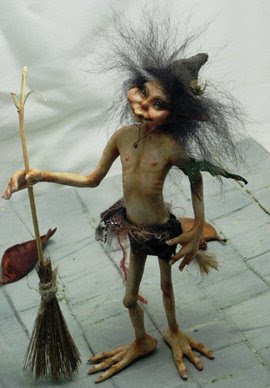 A duende is a fairy or goblin-like mythological creature from Iberian, South American , Chammorro and Filipino folklore. Duendes may also have some traits similar to goblins and kobolds. The word is often considered to be the Spanish and Portuguese equivalent of the English word "sprite" and is used as an umbrella term for any fairy-like being such as goblins, pixies and elves. The Spanish term originated as a contraction of the phrase dueño de casa or duen de casa, "possessor of a house," and was originally conceptualized as a mischievous spirit inhabiting a house. Whoa I itch. 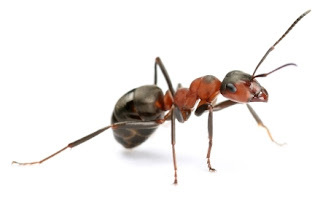 Never run into these ants here before. I was out weeding under a palm in my lawn and woke a nest of them. They are very small but not as small as the ones I find in my kitchen. Much smaller than the leaf cutters. Got out my bottle of "kill bugs" spray and assume they are almost gone. With no rain like we've been having I won't have to weed for quite awhile. Will watch closer next time. 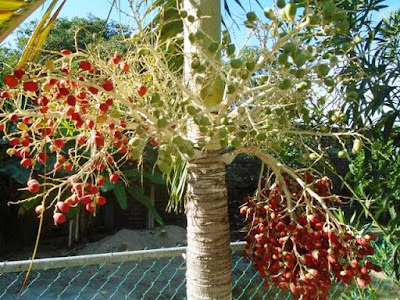 Had to get a foto of the palm berries before the branch falls off. I've never seen quite so many. 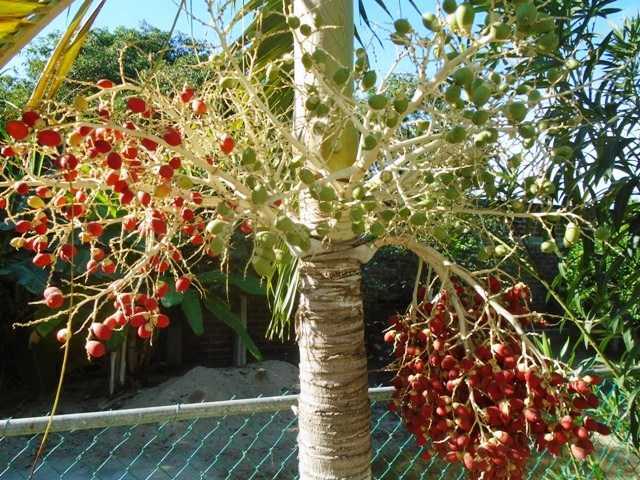 Some will sprout new palms where they fall. Before the berries form they are a mass of flowers that attract bees. 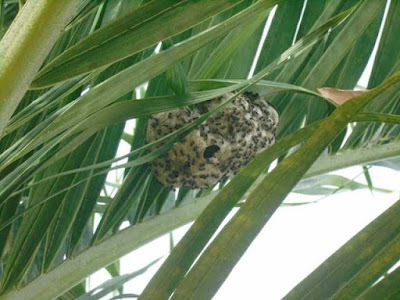 While there I cut one frond that was hanging in the walkway and behind it was a wasp nest. I just took a foto and will post it below when I get it off the camera. The nest is too high to reach and I don't have wasp spray so I guess they will stay for awhile. 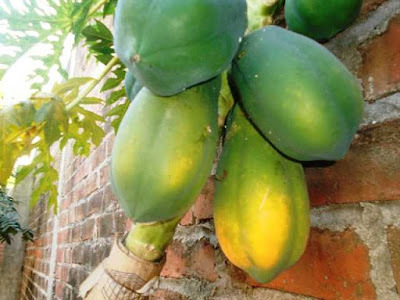 The papayas are not quite ripe but Lorena says we should cut it and bring it inside before the birds get it. Can't remember what happen on the last batch. The tree is up against the wall and held with a wire because it almost fell over a while back. Three Kings Day is coming up this Friday and I had planned on buying a cake today. However, my car is going to the mechanic again today because it overheated yesterday. No idea how long it will be there and I need a car to bring the cake home. Lorena said buy it early because the price goes up on the last day. I couldn't make the car overheat today .... and the Rosca's de Reyes won't be here until "maybe tomorrow" and for sure Friday. Guess that assures they will be fresh. 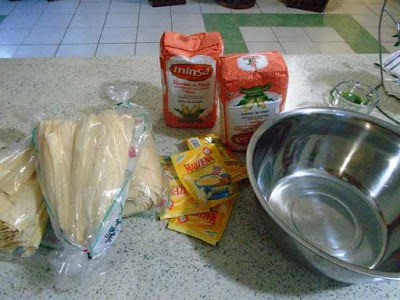 Tamales and Atole is a traditional Christmas Holidays meal. We were going to make them last night but Lorena's grandmom took a fall and taking care of her would have made it too late. We are going to try again today and hopefully I can photograph the process. 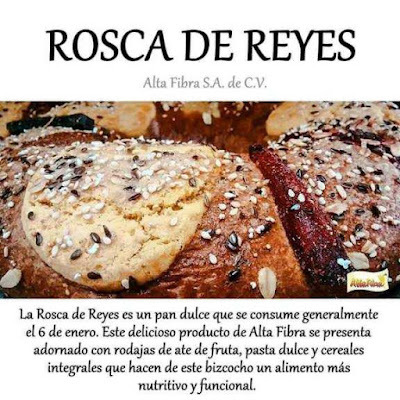 You can buy Masa at the tortilla shops but Lorena prefers to make it herself because it's lighter. Requires water and hot cooking oil .... we'll see. The packets are for Atole which is also a masa-based drink served hot. She wanted strawberry flavor but they only had vanilla. To be continued.